The Isaac Brock Society and Maple Sandbox today issued a joint letter to Mr. Terry Campbell, President of the Canadian Banker’s Association, detailing their opposition to FATCA. The letter, which was hand delivered to Mr. Campbell’s office, is reproduced below. As well, you can download the PDF of the letter here. As citizens and residents of Canada, we are strongly opposed to the Canadian Bankers Association’s (CBA) recently-stated advocacy for an intergovernmental agreement (IGA) that would allow the government of the United States – through the Foreign Account Tax Compliance Act – to impose its tax laws in Canada. 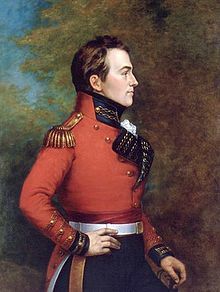 Such an agreement would represent a gross violation of Canadian sovereignty and would violate the rights of Canadian citizens and residents under the Charter of Rights and Freedoms, the Canadian Human Rights Act, the Personal Information Protection and Electronic Documents Act, and other legal guarantees. The CBA’s claim that an IGA would mitigate these violations in any meaningful way is illusory. I think this article speaks for itself regarding U.S. treatment of its citizens, especially those who are most vulnerable or “easy prey.” I’ll quote three passages, just to highlight why I think it’s relevant for us. While I read the article, I was struck by the many parallels created between the situations demonstrated and so many facets of the experiences we have described here on the blog, all at the hands of the (supposedly) greatest democracy in the world. All are linked by fear and control, shame and punishment , confusion and lack of legitimacy, and all result in some form of torture, perhaps in varying degrees, but torture nonetheless. All emphases are mine. Bush, (well really, Cheney, Rumsfeld and the gang), began warrantless interception of Americans’ voice and e-mail transmissions overseas immediately after 9/11. The Terrorist Surveillance Program (TSP) referenced Section 215 of the Patriot Act, and was authorized by being signed in into law in October 2001. In contrast to the TSP, PRISM was enabled by the Protect America Act (PAA) of 2007, which placed it under the jurisdiction of the Foreign Intelligence Surveillance Court (FISC), itself established by the Foreign Intelligence Surveillance Act in 1978 to prevent a repetition of the warrantless domestic wiretapping conducted by Nixon and his subordinates. When the PAA expired in 2008, Congress rushed to keep PRISM lawful and passed the FISA Amendments ACT in 2008, whose Section 702 authorized warrantless surveillance of domestic voice and internet communications to other countries. I think of TSP vs PRISM as being somewhat like the Bank Secrecy Act/FBAR being under Title 31 and abused by IRS applying aspects of Title 26 penalties and getting away with it. This most definitely reminds me of Allison Christians and Abby Deshman (at the Dec 15 FATCA Forum) describing the fact that once personal banking information is reported via FATCA, there is no recourse to having it removed, no way to appeal any mistakes that (almost certainly) will occur. In addition, of course, on the very serious level, the inability to get off the no fly list. The world witnessed the brutal effects that misinformation had on Mehar Arar and the callous disregard the US government displayed toward Canada once the RCMP’s error was exposed. Ellsberg and the ACLU want Section 215 of the Patriot Act and Section 702 of the FISA Amendments Act repealed. Add Senator Rand Paul calling for the repeal of components of FATCA. We all get it. What on earth is lacking in the perception of the majority of the Congress, Treasury, and the IRS? Guantanamo was opened in 2002 to house suspected terrorists. Guantanamo detainees were “charged with no specific crimes and were denied access to legal counsel.” This effectively put the detainees in no man’s land, without any legal standing. Again, the hypocrisy of this demonstrates clearly the disregard the US government has for the most basic principles it was founded on – fairness and the rule of law. How is it that the government considers itself able to strip a person of all rights, lacking even a legal ability to fight charges? Even more disturbing is the recent response of the government to the huger strikes of many of the inmates – force-feeding. The World Medical Organizations stance is that force-feeding is a form of torture. Doctors treating the inmates there say they are being coerced to violate the Hippocratic Oath; this is completely analogous to the situation of having no choice but to surrender and give consent to one’s banking information to be given to the IRS. These doctors have no choice nor do expats. As we all know, the FBI includes expats along with criminals and people with “prohibitors” from obtaining firearms. HIPAA exists in order to keep our personal health information private; closed to others without our expressed and signed consent. It’s other charming aspect is that it also exists as a way to punish those who renounce by being included on the “Name-and-Shame” List. (I will be absoluted delighted to see if my name appears soon, having filed 8854 for 2012). In order to get around this problem, (completely analogous to the farce of IGA’s to get around the privacy laws violated by FATCA) the Privacy Rule would be amended to allow them to report to the NICS database any individual who met one or more of the “prohibitors.” Read: any account with US indicia must be reported. Congress saw no need to change the HIPAA Privacy Rule when it amended the NICS reporting system in 2008. So once again, we have a situation similar to that of Treasury authorizing itself to act in order to tailor the rules in accordance with their own agenda. Never mind that Congress has already spoken. The Bazelon Center for Mental Health cited data in the Federal Register that depicted the great bulk of NICS registry data for all individuals, including that related to the “mental health prohibitors”, as coming from the criminal justice system and the civil courts, which are not HIPAA-covered. Without a doubt, this is an abuse similar to that of expats’ personal financial information being totally exposed via FATCA/IGA. Another interesting parallel of citizens being slighted by their own government is the refusal of the US to ratify the UN Convention on Rights for Persons with Disabilities (CRPD), even when their objections were included via the Reservations/Understandings/Declarations (RUDs). Should the RUD’s be included,the intention of the Convention to bring US laws into line with the Convention is compromised. One most unfortunate result of this would be the fall of all laws which allow for involuntary hospitalization and of the involuntary administration of psychoactive medications. The refusal to ratify this convention is based on the far right’s fear that any international treaty represents a surrender of sovereignty. Yet they expect nothing less of those they choose to force their laws on. Non-ratification closes the only feasible avenue of hope for disabled persons who cannot renounce their US citizenship, putting them in peril of lifelong slavery to IRS reporting. The UN’s Special Rapporteur on Torture has declared all involuntary treatment or treatment without informed consent a form of torture. In last year’s Senate session, despite the RUD’s, the CRPD was defeated and it does not appear on the Committee’s agenda for Congress’s current session. Sound familiar? Congress knows of the unfairness of FATCA/IGA regarding violation of privacy laws (even insisting on the inclusion of non-US spouses’ personal financial information) as well as the obvious 8th amendment violations with the levying of onerous FBAR penalties. They sit there and do absolutely nothing about it. Obvious violations of the Constitution simply don’t move them, doesn’t matter at all. Perhaps the desire of expats to eventually achieve true representation in the Congress would not matter; the fact is, the ideals the country is based upon have disappeared from the horizon and the vast majority of people in the country are absolutely and totally powerless. Further to my post last Sunday here at IBS, SWAT–Switzerland IGA: Still not enough information available in Switzerland, I received a reply email from the Swiss State Secretariat for International Financial Matters (SIF) yesterday. I stand corrected: it seems that I didn’t search hard enough on the Swiss Federal Authorities site (admin.ch) and that not only the agreement text is now available in Swiss national languages, but also a “law of application” has been drafted to enforce the agreement. From what I understand, Parliament will be formally informed of the package to vote on by 15 March 2013, but is not expected to vote on the issue until next summer. It would appear that the Cantons, Communes, Political Parties, etc. are expected to provide feedback by 15 March and this feedback will go to Parliament in some formal fashion, but of course this does not preclude lobbying directly to deputies outside of the formal consultation procedure between now and the vote next summer. We took a break after Professor Christians’ presentation and began again with a brief talk by Anglican Archbishop Dorian Baxter who is the President of the Progressive Canadian Party. He related a very funny story of a conversation with an older member of his congregation who lamented that we no longer had Steve Jobs, nor Johnny Cash or Bob Hope. They talked a bit about this and then applied to current state of Canada – we have no jobs, no cash and no hope! He emphasized that we need to hold the CDN govt accountable to the standard of the Westminster model of Parliamentary Democracy. This relates to a core principle of the Progressive Canadian Party and the illegal “merger” of the Canadian Alliance Reform Party (aka “CRAP”). This provoked much laughter. Then he applied the Westminster ideal to the fact that FATCA is an invasion of CDN Autonomy as well as the Canadian Treasury as it is a money grab of millions of dollars from Canadian families, their children and their children’s children. The emphasis on how bizarrely the indicia rules could be interpreted began to be a framework of the discussion. We then heard from Professor Allison Christians. She studied tax law in the US and has an LLM from New York City University. Point was made that this university has some sort of monopoly on producing international tax lawyers. I’ve just returned from the program. I’m not sure I can really catch all of the most important aspects but the good news is, there were two people recording the proceedings and one plan is to post on YouTube, so you all will be able to hear the presentations as well as capture the spirit and intensity of the meeting. I was quite struck by the difference in how it feels to connect with others about this in the way we are accustomed to; i.e., in the sort of impersonal, anonymous feel to posts on the internet and how much stronger the impact of peoples’ words are, when you are actually experiencing them, face-to-face. Hopefully, this will be the first of many, many more meetings for those of us trying to get FATCA repealed.Please note that I am trying to paraphrase what was said and any mistakes or wrong impressions given are due to my failings. It is impossible to correctly quote everything that was said. I am refraining from mentioning any personal information that was given, though awareness of this during the meeting strongly influenced the impact each speaker had. 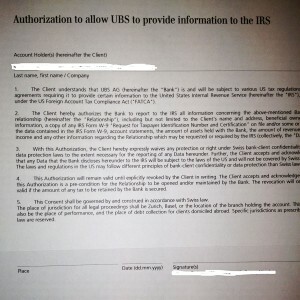 UBS asks “US persons” in Switzerland to Renounce Swiss Data Protection – Let the Outrage Begin! Yesterday, Thanksgiving Day, UBS began the first step of complying with FATCA. How completely unhospitable, all things considered. Americans, green card holders and non-US spouses of USCs received W9s, as well as a form which indicates they agree they will not receive protection under Swiss data laws for the information “requested or required by the IRS.” The explanation given was that FATCA begins January 2013. I wonder if they simply decided to go ahead in spite of the extension to 2014 or if it is a gigantic case of CYA in advance. The extra form suggests that this practice would normally violate privacy laws, but I don’t know if that is true or not. Interestingly, the article states UBS previously asked USCs to tick a box, indicating their citizenship. Do any of our Swiss posters know when this began? I am curious if was a regular practice or something that appeared after the 2009 debacle. “The letters and forms are to be returned to UBS wealth management offices in different parts of the country, the bank unit handling the paperwork. This detail could have implications later for those who do sign the forms. Bank employees advising clients who receive the letters have said that while, for now, UBS has opted not to refuse American clients, at some point in the future these clients may have to foot the bill for the higher cost of handling them.” It is interesting that individual USCs may be required to shoulder the costs as opposed to the bank spreading them out to all clients. I wonder if this will become a practice across the globe. If so, it will put a dent in the idea that other nationals will be outraged by being charged and demand that FATCA or the IGA be refused/rescinded, etc. I am not familiar with Swiss law and don’t quite understand why signing a document which is open-ended (timewise) may cause legal problems. Again, would welcome comments from our Swiss Brockers that would educate us as to what type of privacy laws there are in Switzerland as well as any other info that would shed some light on implications for the future.